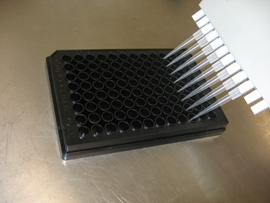 Total Carbohydrate Assay Kit | Cell Biolabs, Inc.
Our Total Carbohydrate Assay detects total carbohydrates within samples based on the phenol-sulfuric acid method. Carbohydrates are hydrolyzed to furfural and furfural derivates upon addition of sulfuric acid, which then react with the Developing Solution to form a chromagen that is detected at 490nm. Total carbohydrate levels in an unknown sample are calculated based on a glucose standard curve.